Any true sports fan knows March is a month to celebrate and what better place to do it than with a VIP package from Surreal Nightlife? Place your bets and start planning your b-ball celebrations now. The Hard Rock is a sports fan’s paradise. The bar is covered in TV screens and projectors so you never miss a moment. You can bet on the game in the “books” at the bar–because, let’s face it, the athletes aren’t the only ones in competition with one another. They even have a monitor tracking the running bets so you can watch the wages unfold. If you download their app, you can bet money right from your phone. With 300 seats, at least 17 monitors, and one giant floor-to-ceiling projection of the game, you will feel like a true bookie at the Mandalay Bay. The book area may not be as glamorous as Hard Rock’s bar, but it still has action and booze with a snack bar. The venue is huge and perfect for large groups of fans to enjoy the game together. Mandalay Bay has a history of high-betting sports games, so be sure to bring a big wad of cash for this venue. 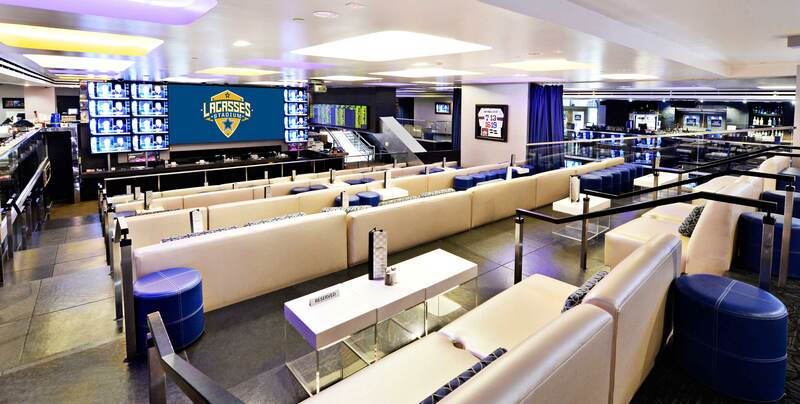 This is hands-down one of the best sports bars in Vegas. The walls are decked in TV screens and sports memorabilia. Geek out over their rare collection of UFC treasures, signed Magic Johnson jerseys, and other nostalgic sports gear. The food here is classic stadium fare: hot dogs, burgers, and soft pretzels to dunk in cheese. But if you like your beer a bit classier, this is the spot. They have a huge selection of beers from all around the world, including a rich Belgian beer served in a tall goblet. This sports book is a more luxurious form of Mandalay’s. With white leather couches you can sink into, it’s got to be the most comfortable place to watch the game. Over 100 TV screens line the wall of this stadium room so that the only time you’re missing the game is when you’re blinking. The food here is also nothing but luxury with a menu designed by the casino’s celebrity chef Emeri Lagasse. A die hard sports fan himself, the man knows how to make some damn good pub food, too. Don’t let yourself get stuck at home watching the game. It’s time to take your sports fan lifestyle to the next level!